So in my last post I had pics of me from last years holiday party. In those pictures I wore a size 54 jacket and size 48 pants. I went to Men’s Wearhouse on Sunday and bought a new suit. I had to, they basically laughed at me when I went in to see if I could get my old suit altered to fit me. You see this year I wear a size 44 coat and size 36 pants. 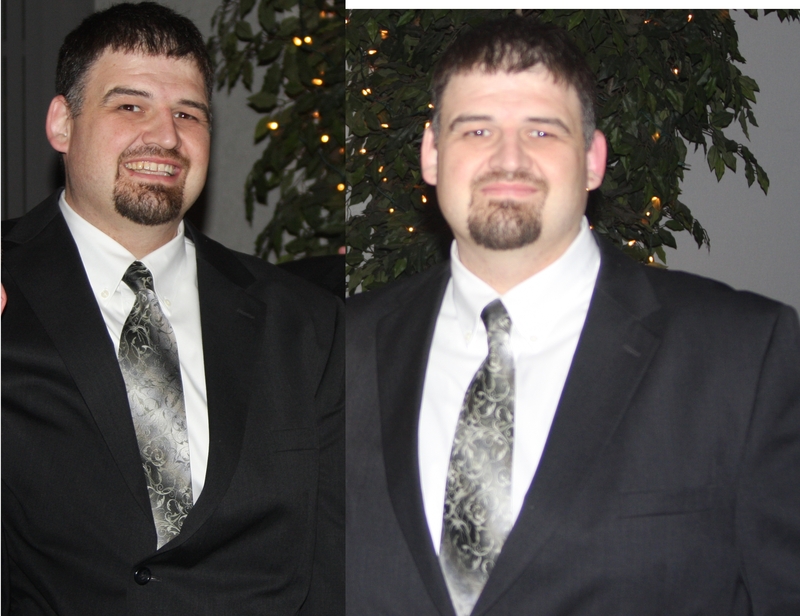 That’s a big difference; so big that they told I had to get a new one, because they couldn’t alter any suit that much. While that in it self is great it’s also not. Sure losing 114 pounds has done wonders for me; for my health and well being, my exercise and eating changes have been wonderful; not so much so for my wallet. In the past year I have spent more on clothing than I have ever had to. While I feel great and have surely added years to my life, my finances are feeling strained because of it. Now, admittedly, I could have bought a cheaper suit than I did. I tried on a few at the mall and none garnered the approval of my wife, so it was off to Mens Wearhouse, where i had $50 in gift cards anyway. My intention was to buy a suit I saw on their website for $249 and since they were having a sale I could get a second one for $100. Great $349 – $50 is $299 not bad for 2 suits. Well they didn’t have the suits from the website in store (big shock) so I looked at what they did have. I ended up with a suit for $299; still not too bad. Add the second one in for $100 and we’re just under $400. Then they get you for tailoring, taxes, toll money, their kids college tuition and such, which I understand, but dang it if I didn’t end up spending over $500 after my gift cards were used up. So once again, I had been hornswoggled. I intended on spending about $250 and ended up doubling it. My wallet took another hit for the team. I feel sorry for it, I really do. I’m liking the fact that I can shop in the “Mens” section not the “Big and Tall” section, which by the way is really just the “Big” section in my opinion. They believe that anyone with a waist larger than 42 is never going to have more than a 30″ inseam; but on the off chance you do it will most assuredly be because you are a gargantuan and have a 36″+ inseam. so all of the moderately tall fat guys get screwed. We either have to buy “highwater” pants or dress like we are Steve Urkel. Sorry I got off track there, where was I? Oh yes my poor, poor wallet. In addition to having to bear the burden of my new wardrobe, my wallet has had to shoulder the weight of higher grocery costs. It’s amazing how much more it costs to eat healthy than to not. For example, I have been trying to move to more and more organic, and where possible locally sourced food stuffs. Here is a comparison with what I believe are fairly accurate numbers for one item. Chicken. One of the most abundantly available meats products know to the US consumer. I never really gave much thought to the chicken, except maybe what to marinate it in on what to slather on it, until I changed my eating habits. Now I consider many factors when looking at this ubiquitous culinary item. Let’s say you want to make some chicken, so you meander on down to your local mega (or not so mega) mart; you are presented with a myriad of poultry choices. Standard fare Chicken, Organic Chicken, All Natural Chicken, Free Range Chicken, Pastured Chicken among the bevy of others. each one with it’s own pricing structure and variance depending on a whole other list of factors. Certified Organic chicken 4-5 pounds: About $8, fed grain, no antibiotics, kept in a pen with a bazillion other birds, crowded but not entirely inhumane treatment, doesn’t get sunlight or weather. Locally sourced Pastured Organic Chicken 4-5 pounds: About $10, fed all natural grain, no antibiotics, allowed to roam and peck around in a field with a bunch of other birds, basically living the good life until he get’s culled for my consumption. So you can see the hit a wallet takes. I want to buy the locally sourced bird. It helps a local farmer, my local economy, is good for me to eat, and I can rest easier knowing that the animal that gave it’s life for my dinner was treated with respect and dignity; but at nearly 2x the cost of the standard chicken I cannot afford to do so all the time. I will usually opt for the certified organic chicken to split the difference but I truly would prefer to get the local bird. This same type of dilemma occurs for everything you buy when you change your eating, The food that is good for you costs more than the food that is not. I understand the economics of it. It costs more to raise the animals/vegetables/unicorns with out antibiotics and growth hormones because there are less overall successes in the end than there are in the factory farmed varieties that are made bigger, and faster with the help of science, chemical voodoo and Brawndo. I just don’t like it, nor do I have to. I do however have to tolerate it. So now my food costs 2x as much, my clothes have all had to be replaced , and I had to buy a new suit. My wallet is sore, it has been taken to the woodshed and beaten within inches of it’s life. What’s a guy to do. What’s your opinion? Tell me your thoughts.